Can I get it in black? It is very hard to anticipate all user inputs in our code but thanks to NLU, we’re able to handle different inputs. DialogFlow, powered by Google, provides a Natural Language Understanding engine that allows us to build conversational interfaces. 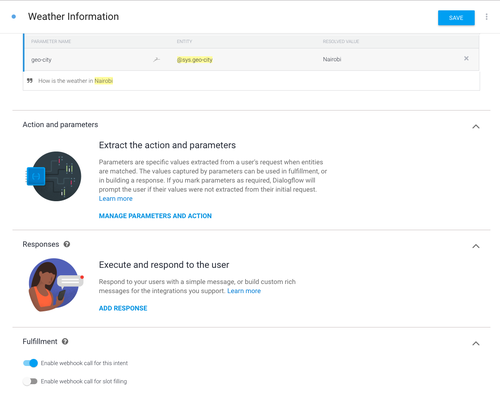 In this tutorial, we’re going to use Dialogflow with a PHP fulfillment webhook to build a conversational experience for a WhatsApp weather chatbot. This tutorial requires a basic knowledge of Dialogflow. We will use a simple agent. If you need to read up, please do so from the documentation. 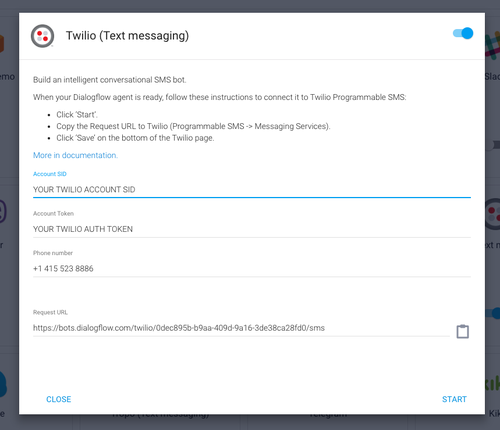 To get started with WhatsApp, we need to first activate our Twilio Sandbox for WhatsApp. Once you have created a new Programmable SMS project, from the dashboard, select Programmable SMS then select WhatsApp. You will be prompted to activate your sandbox. That’s all we need to do for now but I suggest you leave that tab open and switch to a new tab. We will make changes to it later. Our next step is to log in to Dialogflow. From the landing page, click sign up for free and sign in with your Google account. If you don’t have a Google account, you will need to create one. After signing in, create a new agent and name it. I have named mine “weather”. Dialogflow provides a Default Welcome Intent so that is what we will use for this part of the tutorial. This allows Dialogflow to handle all incoming messages from our WhatsApp sandbox. Make sure to click save! Lastly, let’s navigate to the console dashboard. Here we will get the ACCOUNT SID and AUTH TOKEN. 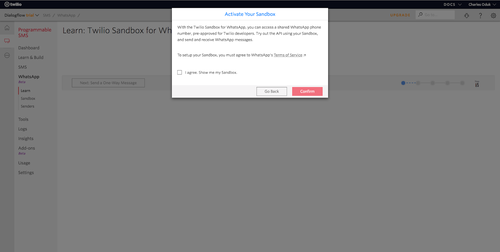 We need to copy the credentials and enter them in the Dialogflow modal along with the WhatsApp number for our sandbox. Once that’s complete, click start. We have made great progress. The response we are currently getting is from a set of responses set on the Dialogflow console. Our next step is to make a PHP fulfillment webhook that receives a user’s input, processes it and provides an appropriate response. "Text defined in Dialogflow's console for the intent that was matched"
* retrieves the weather data of a given city. On line 51, we listen for a POST request from Dialogflow. Then we check if there is a city provided by the user. If so, we go ahead and make an API call to OpenWeatherMap. Once we get the results, we send the fulfillment as an SMS response. For more options on how to build your fulfillment response object, please look at the sample response given here. Note: On line 58, we have not provided an else statement which would lead to a follow-up intent to get the user to enter a city. That is beyond the scope of this tutorial. That is all the logic we need for the webhook. We now need to make our application accessible through a public URL to connect Dialogflow to our local webhook. This is where ngrok comes in! We are going to use the URL provided by ngrok to access our webhook. How is the weather in Nairobi? We mentioned earlier that we would retrieve a parameter called geo-city from the request object. Notice that Dialogflow created that for us when we entered training phrases that contain the name of a city. Lastly, let us enable webhook fulfillment for this intent and click save. Congratulations! You have just created a simple weather chatbot using WhatsApp, Dialogflow, and PHP. You now have a scaffold to go and build chatbots for different kinds of applications such as a restaurant booking chatbot or an online store chatbot.